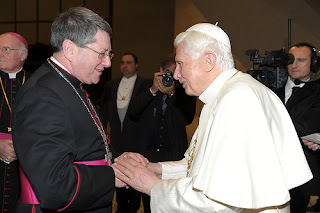 Pope Benedict XVI has donated $250,000 to support the work of the Personal Ordinariate of Our Lady of Walsingham. The gift will help establish the Ordinariate as a vibrant part of the Catholic Church in England and Wales. The news from Rome came to Monsignor Keith Newton, the Ordinary of the Personal Ordinariate, and read “The Holy Father has benevolently permitted a donation of $250,000”. Responding to the gift, Mgr Newton said, “I am very grateful to the Holy Father for his generosity and support. This gift is a great help and encouragement as we continue to grow and develop our distinctive ecclesial life, whilst seeking to contribute to the wider work of evangelisation in England and Wales”. The Personal Ordinariate of Our Lady of Walsingham was established in January 2011 to enable Anglicans in England and Wales to enter into the full communion of the Catholic Church while retaining essential elements of their heritage and tradition. It comprises around 1200 lay faithful and 60 clergy spread across the United Kingdom. The Apostolic Nuncio to Great Britain, His Excellency Archbishop Antonio Mennini, was instrumental in securing the Holy Father’s assistance. On the announcement of the gift the Archbishop said, “The Holy Father’s gift of $250,000 is a clear sign of his personal commitment to the work of Christian Unity and the special place the Ordinariate holds in his heart. I pray for the continuing success and development of the Ordinariate”. Speaking of the need for further fundraising the Nuncio said, “I urge all those who share our Holy Father’s vision to lend their spiritual and material support to the Ordinariate, especially in these early days”. Mgr Newton, in response to the remarks of Archbishop Mennini said, “The support and encouragement given to us by the Apostolic Nuncio has been very significant. We were very pleased to welcome him as the Principal Celebrant of our Chrism Mass: a clear sign of our deep desire to remain closely united the Holy Father”. The Ordinariate welcomed over 250 new members this Easter. Bishop Alan Hopes will ordain deacons for the Ordinariate in Westminster Cathedral on 26 May 2012 at 10.00 a.m., and two men in their twenties were ordained to the Sacred Priesthood in London earlier this month.